The need for integral development is recognized at executive level, which has led to this more holistic approach being designated as part of the National Programme for the Randstad. The provinces of Flevoland and Noord-Holland have been requested to manage an Integrated Development Perspective project for the Markermeer-IJmeer. This scheme was submitted to the Minister of State for the Ministry of Transport & Public Works as an interim model towards a long-term strategy for the area. The Integrated Development Perspective project demonstrates that the ecological decline can be reversed with a systematic approach. This approach aims to create an ecological system that is flexible enough to absorb future changes without a substantial loss of quality. This will help to generate space for the urban and recreational dynamics of the Amsterdam Metropolitan area. To realize the above, more work is needed in ecological terms than is legally required to maintain the conservation levels stipulated in the European Natura 2000 programme. Natura 2000 and the Dutch version of this programme have resulted in an ecological task which is drafted in terms of ecological support for specific species and habitats. However, compliance with the above still leaves the ecological system as a whole vulnerable to natural phenomena (such as storms and climatic changes) and human intervention. The system approach of the Integrated Development Perspective project aims to create a robust ecosystem. The Future Vision for Markermeer-IJmeer demonstrates how the area’s nature is to gradually regain its vitality and resilience. 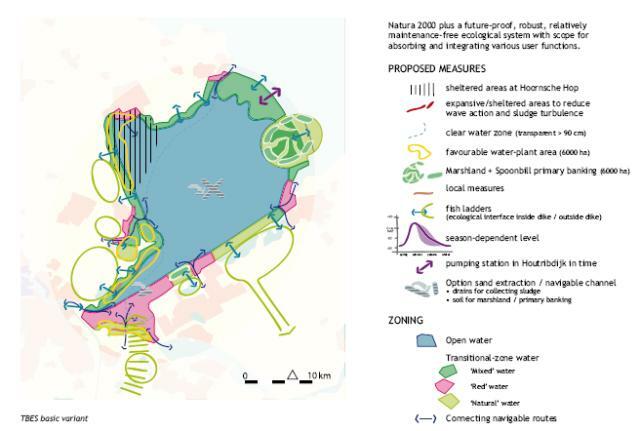 The most notable proposals are the development of an extensive marshland area along the shoreline by Lelystad and ‘primary banking’ at Almere. The marshland and primary banking will result in a greater array of transitional zones, which will provide extra habitats, further increasing the area’s biodiversity. The marshland is positioned to enhance the relationship between land, lake and conservation area for the benefit of the bird life. Another pillar of the plans is sludge management. The realization of zones sheltered from wave action and of sludge drains will create more areas of clear water around the lakes. The end result of all these measures will serve to increase biodiversity and landscape variation. In other words a landscape that is more appealing to plants, animals and people.